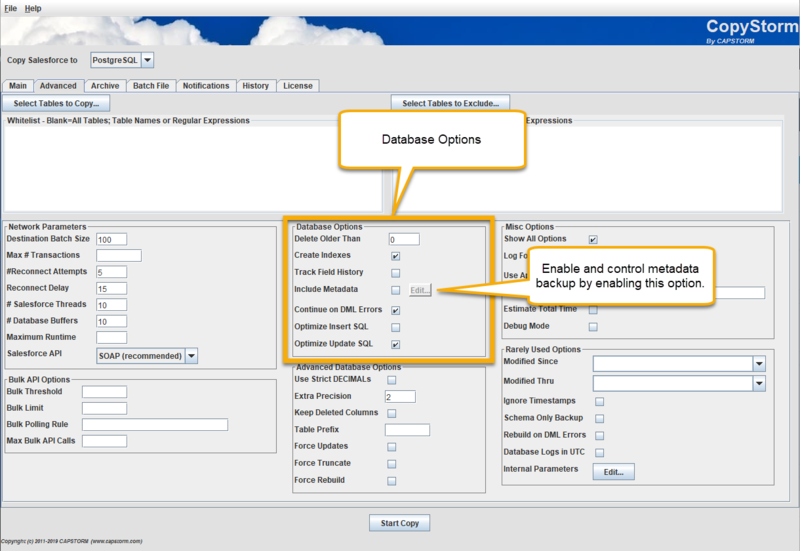 The Database Options section is used to control interactions with the target database. Delete Older Than 0 No Controls when to remove records that have been deleted from Salesforce from the target database. 0 (zero): Remove deleted records immediately from the target database. Blank (no value specified): Mark deleted records as IsDeleted, and never remove deleted records. A non-zero number: Mark deleted records as IsDeleted, and remove records when they have been deleted from Salesforce for the number of days specified by “Delete Older Than”. NOTE: CopyStorm discovers deleted records by reading the Salesforce recycle bin. If the recycle bin is emptied before CopyStorm discovers the deletion, or if records have been removed with a hard delete, CopyStorm will not know that the records are deleted. This method is used by some applications. Please use Capstorm’s CopyStorm/Medic tool to discover the deleted records and mark the records as IsDeleted in the target database. Create Indexes Yes No If checked, CopyStorm will create database indexes for each reference field. Enabling index creation will significantly improve the table join speed in larger databases. Note that an index is always created on each table’s “timestamp” column. Track Field History No No If checked, CopyStorm will log all field changes to a database table named CopyForceFieldHistory. Include Metadata No No If checked, CopyStorm will include selected metadata components in the backup. By default, if checked, all metadata components are included. Clicking on the “Edit” button next to this checkbox allows selection of specific metadata components to be included / not included in the backup. Continue on DML Errors Yes No If checked, CopyStorm will continue processing if a DML error is encountered. A DML error typically occurs when the structure of a Salesforce table has changed in a way that causes an “ALTER TABLE COLUMN” command to fail in the target database. The simplest fix is to drop the table in the target database and let CopyStorm rebuild it. If checked, CopyStorm will log an exception, skip the problem table, and continue with the next table. Optimize Insert SQL No No If checked, CopyStorm will not include NULL data in generated INSERT statements. For wide tables with many NULL values this may be considerably faster than unoptimized INSERT statements. Optimize Update SQL Yes No If checked, CopyStorm will compare data from Salesforce with existing data in the CopyStorm database and build minimal SQL UPDATE statements. For wide tables with few changes this may be considerably faster than unoptimized UPDATE statements.